If you're starting to unpack Fountas & Pinnell Classroom™, here are some practical tips on organizing your classroom for each instructional context. Interactive Read-Aloud: Interactive read-aloud takes place in the whole-class meeting area of your classroom. It is ideal to have a bright rug or natural barriers, such as bookshelves, to mark the area. Children sit on the floor, so arrange your chair and an easel to give all children an unobstructed view. As you finish with a book, you can move it to a bin in the classroom library or display it on the easel or bookshelves, offering children the opportunity to choose to read it independently. Keep interactive read-aloud lessons, books, and supplies in your resource area for easy access. Shared Reading: As you arrange your classroom for shared reading, be sure to accommodate children so that every child can see the big book or chart. Store texts and tools nearby for easy access. Reading Minilessons: Many of your lessons on management, skills, strategies, and literary analysis will flow from observations you make during interactive read-aloud and conferring with children during independent reading. When organizing your classroom for reading minilessons, designate wall space near the meeting area to display anchor charts with principles that children are currently learning and applying. 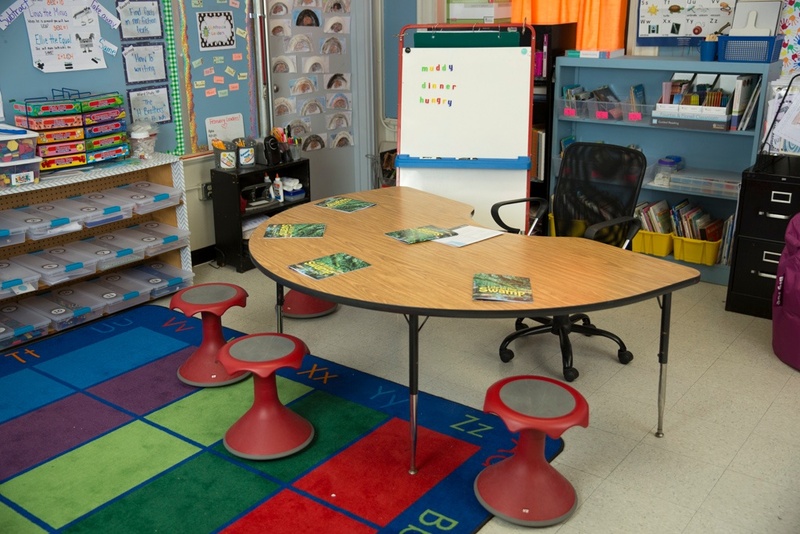 Guided Reading: Your guided reading area is best located in an area of the classroom that accommodates a table large enough to seat 4-6 children and yourself. A kidney-shaped table is ideal. Arrange the table so you sit facing the children and classroom, allowing you to monitor the children working in independent work areas. Ideally the lessons and books are arranged by level on shelves behind your small-group table, allowing you to easily retrieve and return instructional materials. Phonics, Spelling, and Word Study: When you present phonics and word study lessons, you will need a pocket chart; picture, letter, and word cards; and chart paper. Store your lesson folders, Sing a Song of Poetry, and Ready Resources in your resource area to streamline planning and the gathering of materials. For more tips on organizing PWS, refer to this Phonics, Spelling, and Word Study System Unpacking Document. Independent Reading: Choose a place in your classroom to create a classroom library. Shelves that accommodate book bins are ideal, with bins organized by genre topic, author, and interest for easy access and browsing by children. Organize the conferring cards in your resource area, so that you can quickly pull the appropriate cards to support your conferences with readers. Book Clubs: Book clubs can take place anywhere in your classroom where there is room for small groups of children to sit, either in a circle of chairs or in a circle on the floor, and discuss books together. Designate a shelf in your resource area where you can store the books and discussion cards together for easy access. From the Fountas & Pinnell Classroom™ System Guide by Irene C. Fountas and Gay Su Pinnell. Copyright (c) 2018 by Irene C. Fountas and Gay Su Pinnell. Published by Heinemann. If you have any questions or comments on this topic, please go to our Discussion Board. Through high-quality, exciting books, learning extend beyond the classroom. FAQ Friday: Is Fountas & Pinnell Classroom™ Aligned to State Standards?